How you became involved in Mountain Challenge: I interviewed for the Fellowship when I was as senior in high school, and was so excited when I got it, so from Day 1 of Freshman year I was putting together packs, shadowing ropes courses, and playing outside. Most meaningful Mountain Challenge experience: This is a tough one, but it probably happened after I had officially walked across the stage— I woke up one morning and found myself standing on a porch, listening to Howler monkeys, eating beans, eggs, rice, and fresh fruit for breakfast, and then being dragged off to a hummingbird garden—in Costa Rica. My whole Costa Rica experience taught me the power of Pura Vida and how to live and enjoy the most pure life possible. How Mountain Challenge impacted/influenced your career or career choice: I eventually want to settle down and teach hordes of undergraduate students the joys of Biochemistry and Molecular Biology and how science impacts their life. Mountain Challenge influenced this decision by showing me I have the ability to teach almost anyone anything. From the wisdom of a tennis ball named Wilson to a very Wendy Ridge to how dangling 59.5 feet in the air is like climbing out of a swimming pool. If I could teach important CEOs, football players, and high school students to work together using the outdoors, then I can teach college kids how cool science is using the outdoors, a lab bench, the human body, and anything else in the world. Anything else Mountain Challenge taught you or was otherwise significant in your life: Mountain Challenge gave me the ability to be a leader. I was taught how to speak to every kind of group imaginable, and I was taught how to handle stressful situations. Mountain Challenge also instilled in me the confidence I needed to get through 4 years of undergrad as well as chase after a seemingly impossible task—the PhD. 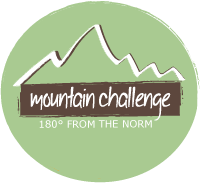 But above all, one of the most important things Mountain Challenge gave me was the knowledge of the importance of fitness and how being fit positively influences my life.